One thing I have learned in photographing all the amazing girls that I do, is that passion, desire and dedication run really deep when you love what you do. And loving what you do is the true key to so many people’s success. It is undoubtedly a gift when work doesn’t feel like work. For Olivia Rodrigo, acting and working on the Disney series Bizaardvark has given her just this type of inspiration and this quirky and loved series is just the start of many more opportunities she plans to pave on her way. Meeting Maya Brenner for the first time; her zen-like ways, whimsical manner, and beautiful smile are all instantly inviting. It is easy to see why Brenner’s jewels and home accessories have become sought after by every cool California girl and beyond. It is her innate sparkle that Brenner showcases through her work that makes everyone ultimately want to accent themselves (and their homes) in her charming baubles and adornments. Maya talks about designing for herself and how her mom has nicknamed her the “reluctant entrepreneur” (okay she doesn’t like the accounting, deadlines and such – who does?). All that being said, every joy and challenge in creating this global business has been part of her process and it is exactly where she wants to be. There is good design in everything touched by Laura O’Dell. 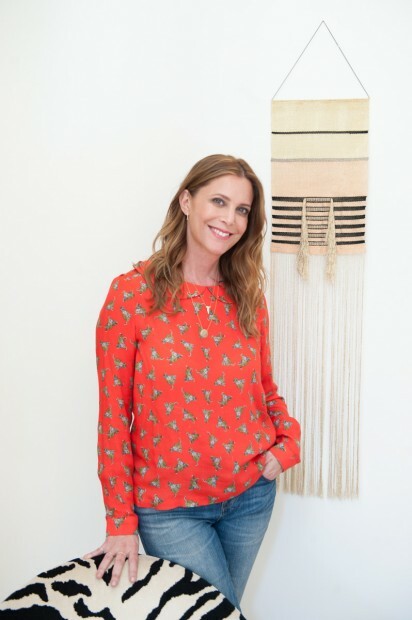 Not only is she one half of the coolest wife & husband fashion design duo, she is now owner of the cheeky, fun Bucks and Does boutique in Silverlake (the hipster hood of LA). The storefront houses Laura’s most chic curation, a style that is uniquely her own. The yurt in the back acting as the studio design center showcases just how different and out of the box the O’Dells choose to go. Laura with her upbeat attitude and fun-loving family has created a dream job situation where she can do and be what she loves, and still have time to custom design the wall paper.